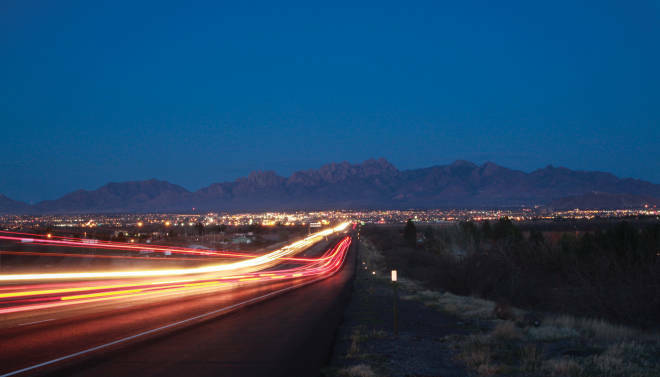 Above: Las Cruces&apos; multiculturalism gives way to wonder in the nearby Organ Mountains. Photograph by Getty Images. THE WALLS OF CASA CAMINO Real Books, in Las Cruces’ historic Mesquite district, likely haven’t seen the light of day since Chicana author Denise Chávez and her husband, Daniel Zolinsky, began renting there six years ago. The historic adobe house is packed with works from nearly every notable New Mexican writer, original movie posters from classic Mexican films, photographs of El Paso in the early 20th century, artworks, records, and more. Chávez, who was born and raised in Las Cruces, dreams of creating a bookstore-meets-café-meets-archive of Chicanx literature—she’ll call it the Museo de la Gente—but her bookstore already feels like a museum, a key to the deep history of Las Cruces, a place shaped by the many currents passing through it at any given time. Las Cruces means “the crosses,” and three stand on a hillside above town, but the name gets at something more than religion. This city has always been a crossroads. The Camino Real, an Ancestral trade route officially established in the late 16th century that connected Mexico City to Okhay Owingeh Pueblo, passes through the heart of town. In the 1600s, Pueblo people, nomadic tribes, and Spanish settlers swapped coral for turquoise, and macaw feathers and seashells found their way into Native jewelry and clothing. Close to both Texas and Mexico, Las Cruces still swaps, borrows, and reinterprets without losing its singularity. The city’s proximity—just under 50 miles from El Paso and Ciudad Juárez—bleeds into the music, the food, and the language. Las Crucens speak a casual, more Mexican Spanish than in northern New Mexico, and you can’t go a day without hearing a Texas drawl. It also lends to a sense of openness. Chávez remembers, in her youth, when the border was just a river—no militia, no dogs—that you’d cross in a chalupa (a small boat) to gather firewood or visit a friend. Though the border is less porous now, Las Crucens retain an affability and familiarity with strangers and friends alike. Geographically, it’s a city defined by open space and the intersection of wildly different topography, too. Northern New Mexico, by comparison, feels hemmed in; Chávez moved north for several years but returned home for the wide-open skies and the effect that the spaciousness has on her psyche. There’s something otherworldly about the land surrounding Las Cruces and the projects it’s hosted over the years: nuclear tests at nearby White Sands, rocket launches at Spaceport America. Like you’re almost to heaven, or almost to hell. THE COMPACT, CRAGGY MESS of the Organ Mountains rises sheer from the Mesilla floodplain just 10 miles out of town, a sky island in a sea of flat Chihuahuan Desert. At just over 9,000 feet—4,500 feet above the surrounding grasslands—the Organs are one of the steepest mountain ranges in the American West. The area was designated a national monument in 2014, along with the nearby Desert Peaks, Doña Ana Mountains, and Potrillo Mountains, after years of community advocacy for its protection. Above: The Farmers and Crafts Market invites shopping and eating—and Mexican -wrestling costumes. Photograph by John McCauley. Chris Land, the founder of local apparel company Organ Mountain Outfitters, considers the range underrepresented. “They’re not on the national parks list that everyone wants to visit,” he says—but that’s not for lack of recreational opportunity. The monument spans nearly 500,000 acres, encompassing singletrack mountain bike trails, rugged climbing on granite walls reminiscent of Yosemite, horse-packing routes, and ample hiking trails. Coming from Las Cruces, the nearest trailhead is at Dripping Springs, which houses an information center and serves as the jumping-off point for a handful of paths. A mellow three-mile loop takes hikers past a historic homestead and into Soledad and Bar Canyons, home to green pools and waterfalls in the wetter seasons. The Needles hike, which takes you to the top of the Organs’ highest peak, is more adventurous, gaining nearly 4,000 feet of elevation in three miles. On the opposite side of the mountains, the Aguirre Springs campground offers access to several more trails in addition to developed campsites. The trails are quiet, just like Las Cruces’ downtown area. Despite being the second-largest city in the state, it has a relaxed pace and a small-town vibe. Some of the best restaurants in town close early: Nellie’s Café serves traditional southern New Mexican fare, like crispy flautas and sopaipillas smothered in carne adovada and cheese. The Shed, a local favorite in Old Mesilla, offers excellent breakfast staples with a twist, like red chile Benedict. Both close at 2 p.m.
Old Mesilla is the most historic part of Las Cruces—technically a separate town, although both inhabit the same metropolitan area. It houses a historic plaza, old adobe buildings, and an excellent bar: the Double Eagle, right on the plaza. The building dates back to the mid-19th century, and the opulent, antiques-filled space houses a long chestnut bar beneath massive crystal chandeliers that belie the reasonably priced drinks. The place is known for its jalapeño-cucumber margarita and its resident ghosts. The Lundeen Inn of the Arts, a bed-and-breakfast packed with more than 300 works of art, is the best hotel in town. A mother and daughter with fine taste run the cozy and hospitable inn. After a night in one of their seven thoughtfully decorated, impeccably clean rooms, you’ll eat breakfast with the owners in a high-ceilinged, light-filled living room. When I dropped in, a Bolivian guitarist, two mountain bikers, and a pair of mountaineers were chatting over coffee and eggs. 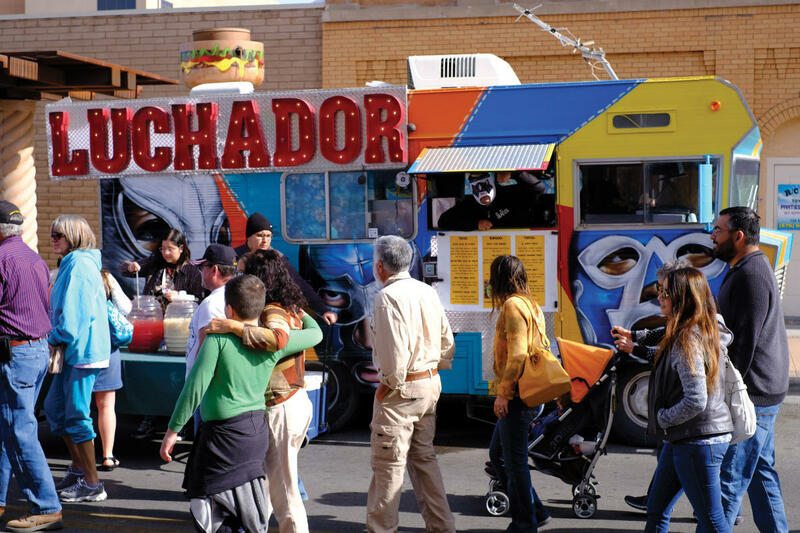 On Wednesday and Saturday mornings, Las Cruces’ downtown streets grow vibrant with the Farmers & Crafts Market. Cowboys sell local beef and hand-tooled leather, beekeepers offer honey from the Mesilla Valley, horticulturists sell native desert plants, and teenage musicians warble on the sidewalk. The Farmers & Crafts Market of Las Cruces is open 8:30 a.m.–1 p.m., Wednesdays and Saturdays. The New Mexico Farm & Ranch Heritage Museum—part working farm, part museum—tells of the region’s long and rich agricultural history. Every December, pilgrims walk from the center of nearby Tortugas Pueblo to the top of Tortugas Mountain, in honor of Our Lady of Guadalupe. For a dog-friendly stay with a pool and restaurant, try the Hotel Encanto de Las Cruces.